If you’re someone who happily created pixel art using Paint on Windows XP or Windows Vista, you’re probably going to hate the new Paint in Windows 7. Even though the new Paint has some new features and uses the new Ribbon UI that Microsoft is using across all its Windows and Office products, they have also removed a lot of cherished features. In this article, I’m going to go through some of the features that have been removed and others that have been added. After using the older version of Paint and the new version, I can see how newcomers to Paint may find the new version to be just fine, but veterans will be fairly disappointed. I’ll also write about how you can get the old version of Paint and use it in Windows 7 and higher. If you just want to do that, skip down to the Install Old Version of Paint in Windows 7/8/10 section. First, let’s take a look at the GUI interface differences. As you can tell from the images below, the Windows 7 Paint interface is completely different than the XP and Vista version of Paint. What’s Good in Windows 7 Paint? Unfortunately, there aren’t many aspects of the newer Paint that are that great as compared to older versions, however, here is what I could come up with. In terms of the GUI, the new version of Paint certainly looks better. That doesn’t necessarily mean it is easier to find the tools or options you want, but the interface is clean and modern. I’ve been using newer versions of Office for the last couple of years and have gotten used to the ribbon interface, so that’s not a big deal seeing buttons rather than menus. Also, Windows 8 and Windows 10 use the same ribbon interface across the OS, so everything is going in that direction. Thankfully, you can still use the CTRL and + to increase the size of the line thickness when using the various drawing tools. In the dropdown, there only four sizes to choose from, which is pretty useless, so it’s essential to still have the ability to adjust the thickness to any size using the hotkeys. Another positive is that you can still paste an object and use transparency to remove the white parts to reveal what is underneath. I thought they had gotten rid of the transparency feature, but it’s just hidden under the Select button. The only other positives I can think of are the inclusion of some more brushes and shapes. Paint was always meant to be a very simple tool, so there aren’t a whole lot of tabs, buttons or options to start off with. What’s Bad in Windows 7 Paint? Lots of stuff in my opinion! Most of these complaints are minor, but they all add up to a very frustrating experience for veteran users of Paint. Let's start off with one of my biggest problems: automatic anti-aliasing on everything. Some people will love this feature, but a lot of people will simply hate it. For casual users, anti-aliasing makes everything look smooth and nice, but if you are a graphic artist, you may not necessarily want everything smoothed out automatically. An option should have been added for this to turn on or off. In the older versions of Paint, you could start drawing a line and then continue drawing another line immediately after releasing the mouse button. This made it really easy to do point-to-point drawing using Paint. Now whenever you draw a line, it selects the line and you can’t continue drawing from that point. This is really annoying and makes drawing in Paint a lot more difficult. What I mean is when you draw solid colors using the brush and then try to fill it will a different color, the new Paint leaves an outline around the brush stroke. In Windows XP and Vista Paint, this was not an issue. You could just fill the brush stroke with another color and it would fill the entire stroke without any outline. Again, minor change, but makes a big difference to certain types of designers. There is a way around this and that is by using the Pencil tool, drawing the line and then using the paint bucket. When using the pencil, there is no black outline. If you did a lot of pixel by pixel editing in Paint, the older version let you really make edits on a pixel level using the solid pixel brushes. Now you have all these newer brushes like airbrush, crayon, etc, which are just fine, but the older ones should not have been removed. There are other issues, but I won’t waste too much time on that. Some stuff is just really hard to find, whereas it was obvious in previous versions. For example, inverting colors in the older version was easy: just click in the menu or use the hotkey. In the new version, you have to right-click on the object and then you’ll see the option. Not a big deal, but takes some time to get used to if you came from the older version. If you can live with the new version of Paint, then congrats. If not, it might be worth reverting back to the older version. Luckily, there is an easy way to get the older Paint in Windows 7 and higher. Actually, there are two ways: download a program or manually replace the Paint in Windows 7. The first method is easier for sure and less risky. 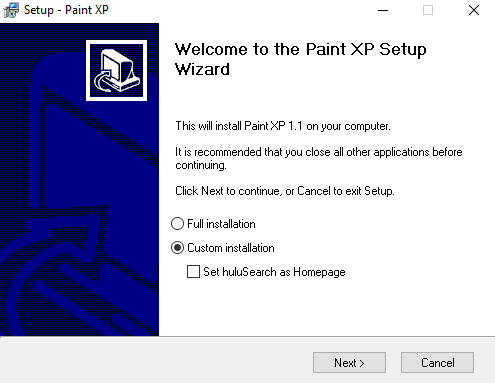 Paint XP is the standard old MS Paint that you can run on Windows 7 and Windows 10. When you run the EXE file, make sure to click on Custom Installation then uncheck the extra junk software that it wants to install. As long as you do that, you’ll only get the Paint program and nothing else. The second method is more technical, but thankfully someone has written a detailed tutorial. Hopefully, one of those two methods work for you. If you have any questions, feel free to post a comment. Enjoy!